Christmas is fast approaching and I can't think of a better gift to give (or receive) than the newly released 2010 Winnipeg Animal Services Calendar designed by Oblada Creative! More than just a pretty thing to hang on the wall, the piece serves a dual purpose by also acting as a guidebook for dog owners including training tips, information on local veterinarians, and a list of the best Winnipeg-area places to take your pooch for a stroll. Sure, you can get a free calendar from your insurance broker but all proceeds from this one benefit the dogs at the pound. For this reason, I feel it will be the best $10.00 you've ever spent. Guaranteed. 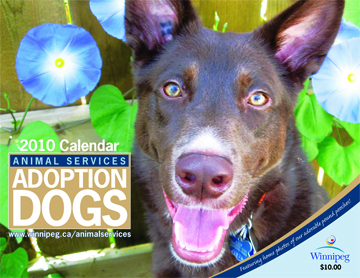 The calendar is available for purchase at Winnipeg Animal Services located at 1057 Logan Avenue.